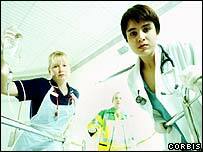 The NHS could struggle to treat some critically ill patients this winter, doctors have warned. A report by the Intensive Care Society, which represents critical care staff, says hospitals could run into serious problems because of a lack of intensive care beds. The report says a lack of money is to blame and suggests the bed shortage could see lives being put at risk. But Health Secretary John Reid has dismissed the claims, saying patients have nothing to worry about. Health Minister Rosie Winterton said working methods had changed, meaning there were more beds for intensive care patients, but in other areas of hospitals. She told BBC Radio 4's Today programme that the criticisms showed there was a "misunderstanding" on the issue. However, the society insists there are huge variations in intensive care across Britain. In some areas, where there are serious shortages of beds, critically ill patients often need to be transferred to other hospitals. This increases the risk of complications, according to the report which is based on a survey of society members. The society says the biggest problem has been the slow growth in intensive care beds in recent years. It says the UK has some of the smallest intensive care units (ICUs) in Europe. It also has very low numbers of critical care beds and spends less on intensive care than many other countries. Just 2.6% of acute hospital beds in the NHS are in intensive care units. This compares to 4.1% in Denmark. The society says that just 226 extra beds for the most critically ill patients have been opened since 1999 - averaging just one extra bed per intensive unit. It claims the number of intensive care beds has actually fallen this year. The report adds that there is no evidence that £14m earmarked to improve services this year has reached patients. Dr Saxon Ridley, president of the society, predicted the NHS will struggle to cope over the coming months. "A bed crisis this winter is inevitable. A shortage of beds is a serious risk to patients who are critically ill.
"It is vital that the issue of funding in critical care is addressed and more ICU beds be made available." Dr Ridley said doctors would help hospitals to draw up contingency plans to try to avert a crisis. "The society will encourage its members to notify their trusts of the likely impact of a surge of critically ill pacts over the next few months. "Hopefully, this will allow contingency plans to be drawn up and so minimise the adverse effect on elective surgery." The health secretary criticised the report and accused the society of scaremongering. "There is no actual evidence in this survey to suggest that any patients will receive inadequate critical care. "It is irresponsible for the ICS to use an informal canvass of some members' opinions in order to worry the public and patients without reason. "Capacity for critical care is at record levels with 3,128 beds, a 32% increase since January 2000," Mr Reid said. "Of course, everyone knows that sometimes there may be exceptional demand for services in exceptional circumstances. "We are not complacent, we recognise that there is more to do, and we want to see further increases in critical care capacity. "However this is an outrageous way for a NHS pressure group to lobby for a particular interest." Liberal Democrat health spokesman Paul Burstow said: "For the government to have allowed the numbers of intensive care beds to have fallen is extraordinary. "It is putting patients' lives at risk and jeopardising the ability of the NHS to cope especially in the run up to winter." "The Intensive Care Society says facilities are at breaking point"